Starbucks 40 years of expertise in sourcing and roasting the finest coffee beans has now been brought to the K-Cup® portion pack, bringing the aroma, body, and rich flavor of the Starbucks Experience to your home. It's the coffee you love from Starbucks, now designed for making a perfect cup in less than a minute. 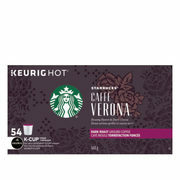 Caffè Verona is one of Starbucks store’s top selling coffees.